I started playing guitar at age 12. I have been teaching guitar professional for 12 years and have studied under some great guitarists. Some of these guitarists include Greg Norris, James Soll, Pete Pancrazi, Joe Felice, and Dan Davis. I started teaching out of my house then moved on to academys and music stores. I am also attending a college program where I am pursuing my degree in music. Started playing guitar at age 12. Erik has been instructing professionally for 12 years. He has also had professional instruction with the instruments he teaches and college training as well. Erik D- has over 12 years years of music experience in the Mesa area. 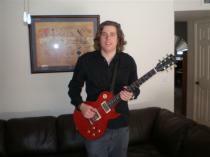 Erik D- is proficient in and teaches Guitar Lessons, . Performed at weddings, Parties, etc. Has had 12 years of professional teaching with private and group lessons. Erik D- is willing to travel up to a distance of 25 miles Miles to teach a lesson in your home.